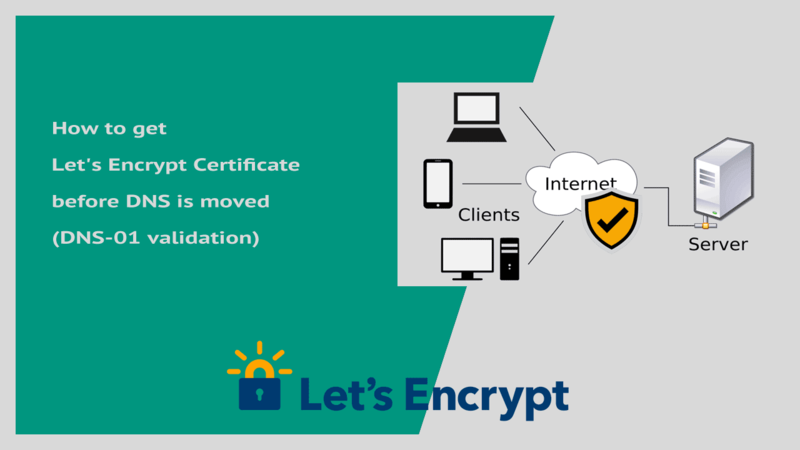 Letsencrypt issue certificate via an automated process with minimal user interaction. This is done by using an ACME client software like certbot. In order to obtain a certificate, you need to prove the ownership of the domain name which the certificate is requested. By Default certbot client check whether the website is hosted on the same server where the certificate request was made. So in order to obtain a certificate, DNS records should pre exist, pointing your domain name to the server where you going to install the SSL certificate. For example, let us assume that your domain name example.com is hosted at server1. Now you're planning to move your website to the server2 and you want to install a Letsencrypt certificate on server2 before updating the DNS record. Letsencrypt DNS validation will be failed at server2, because DNS still pointing to the server1. The solution is to validate your domain name using the manual method by adding a TXT record (DNS-01 validation). Now go to your DNS control panel (provided by your domain name registrar or your DNS service provider, for example cloudflare) and add a TXT record as instructed by the certbot. Once the DNS record has been updated, Press Enter to Continue and obtain the fee SSL certificate. Note that The manual plugin only works with certonly option, thus certbot will not configure an HTTPS virtual host for your apache/nginx web server.